Tetris Battle T Spin is a great technique if implemented right for topping out your opponent in Facebook effectively. Basically, you will have to build your blocks in a way that the right side is one line higher than the left side while leaving a gap at the right where the head of T block will fit. 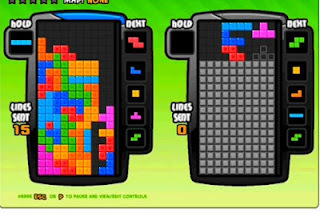 I am not a master of T-spinning and I don't know if the blocks' colors matters so here is someone's Tetris Battle T-Spin tutorial if you want to learn how it is done (it's pretty awesome).